Vitamins are vital, and we should always take more, right? Everyone needs to get a minimum amount of vitamin B12. But taking too much vitamin B12 can make your acne worse, and even trigger breakouts when you have clear skin. On the other hand, certain acne medications can cause a deficiency of vitamin B12 that leads to pernicious anemia, without administration of additional B12. Some oral medications for acne can interfere with the body’s absorption of vitamin B12, which is essential for cardiovascular and neurological health. Vitamin B12 is essential for cardiovascular and neurological health, as well as for the production of hemoglobin for red blood cells. Some oral medications for acne can interfere with the body’s absorption of vitamin B12. Vitamin B12 injections can trigger acne flares. When vitamin B12 injections cause acne, there are numerous, uniform pimples all over the face. Vitamin B12-induced acne goes away after injections are stopped. No one should risk pernicious anemia to avoid acne. The best approach to dealing with acne problems is to buy an acne treatment system, such as Exposed Skin Care. Vitamin B12 has the most complex chemical structure of all the vitamins. It consists of an organic molecule organized around a central atom of cobalt. There are three forms of B12 the body can use, all of them known as cobalamin, after the cobalt in the vitamin. Cyanocobalamin is the form of B12 found in supplements. It is used in supplements because it is easy to make, and the body can easily convert it into the methylcobalamin and 5-deoxyadenosyl cobalamin it actually uses in enzymes. One of the enzymes the body makes with vitamin B12 is involved in detoxifying a substance called homocysteine. The other of the enzymes of the body makes with vitamin B12 is essential for the production of hemoglobin, the iron-rich protein that the blood uses to transport oxygen. Without enough vitamin B12, it is possible to develop a form of anemia known as pernicious anemia, in which the body has enough iron but cannot use it to make hemoglobin for red blood cells. Some people who use retinoid drugs for acne need B12 injections to prevent high homocysteine. Retinoid drugs applied directly to the skin, such as topical tretinoin and Renova, don’t have this effect. Retinoid drugs taken as a pill, however, can interfere with the action of an enzyme called cystathionine-beta-synthase. This enzyme converts homocysteine, which can inflame arteries, into a harmless form. 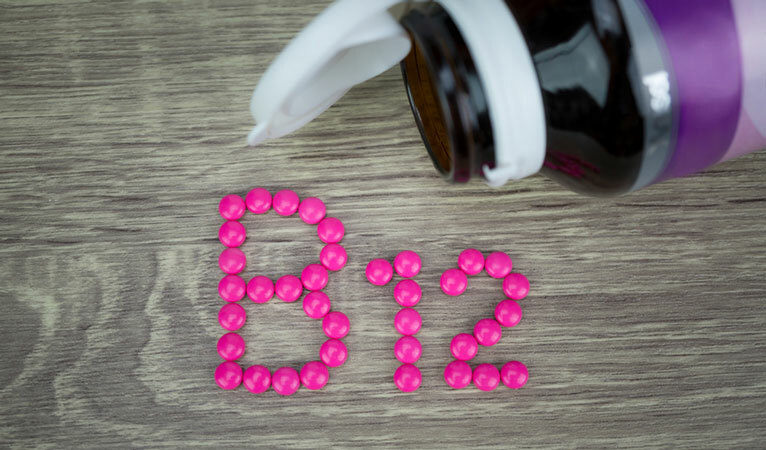 Taking more B12 compensates for the poor performance of the enzyme and helps prevent cardiovascular complications. Just one injection usually is enough. Many people who get vitamin B12 injections for pernicious anemia, on the other hand, break out in a very particular kind of acne. Injections of vitamin B12 don’t cause one or two pimples to break out. Injections of vitamin B12 often cause massive numbers of identical pimples to break out all over the face. It is easy to identify this kind of acne as due to vitamin injections because all the pimples will look the same. If you need vitamin B12 injections, however, you are almost certainly taking them to correct a condition that is even more serious than acne. The good news about vitamin B12 excess and acne is that the blemishes go away about two weeks after the last B12 injection, even if you do not do anything to treat them. If you have brown, black, or Asian skin, you will probably get a better long-term result if you do nothing for acne caused by B12 injections, because most acne treatments for blemishes that are this extensive will leave brown spotting on the skin. Is It Safe to Take a B12 Supplement If You Have Acne? The amount of vitamin B12 you get in a “complete B” vitamin supplement is not enough to make your skin out. Neither is it enough to treat pernicious anemia (that requires injections), but it will help prevent both high homocysteine and pernicious anemia. Do You Need to Take a B12 Supplement If You Have Acne? If you are not using any oral medications for treating acne, you do not need extra B12 for fighting acne. Nonetheless, there are many situations in which taking supplemental vitamin B12 is a very good idea. If you take a proton pump inhibitor such as lansoprazole (Prevacid) or omeprazole (Prilosec), the drugs may reduce the amount of acid in your stomach to the point it cannot release vitamin B12 from food, although there is enough stomach acid to dissolve vitamin B12 from supplements. Deficiency conditions usually take several years to develop. The H2-receptor antagonists such as cimetidine (Tagamet), famotidine (Pepsid), and ranitidine (Zantac) can also interfere with the release of vitamin B12 from food, but their effects are not as severe. The diabetes medication metformin (Glucophage, Glucophage XR) binds vitamin B12 to calcium. If you use metformin, as tens of millions of type 2 diabetics do every day, then taking your vitamin B12 supplement within two hours before or after eating dairy products will not do you any good. And taking the antibiotic Neomycin by mouth can also interfere with the absorption of vitamin B12. What About Vitamin B12 Ointments and Lotions for Acne? There is no evidence that creams and lotions or any other kind of topical skin care products containing vitamin B12 have any special value in treating acne. There is a little evidence that vitamin B12 creams may help psoriasis. There is also a product that contains an anti-irritant known as licochalcone with vitamin B12 for treating eczema in children, although the product is currently only available in Thailand. A study done about 30 years ago found that vitamin B12 is involved in the immune system’s response to staph infections, but no follow-up research confirmed the initial observations. On the other hand, there is no evidence that creams or lotions or any other kind of topical skin care products containing vitamin B12 make acne worse. There is no reason to reject a product because it contains vitamin B12, but there is no reason to buy it, either. You can spend a lot of time looking for special products that don’t really work all that well. Or you can spend far less time and far less money (less than $100 for 9 different products that work together) for an acne-fighting system offered with a money-back guarantee such as Exposed Skin Care. I've never had a B12 deficiency but decided to supplement with B12 several months ago. Well i ended up taking way too much. Since then I've had terrible acne and its not going away. I stopped the B12 supplements as soon as I saw that my levels were through the roof after a test. How long for the levels to lower and my face returns to normal? I've never had acne in my life. It's been 5 months since I last took any B12. The acne is mainly all over my forehead. Comedones everywhere! I have the exact thing, i thought i was the only one, its mainly on my forehead and i never had acne before... its been two months since the last injections, since your post is from 2014 im hoping you found a solution?? I got cystic acne all over my face to.i got it about 11 months ago,and chin and cheek acne just won't go away.its horrible.i would always get complimented on how nice skin I had.its depressing. I have the same finished my 6 injections just over 4 weeks ago and had this horrid outbreak on my forehead, temples, chin,cheeks and chest had them for about 5 weeks now never had any problems with my skin or acne before how long does it last?? Its horrible and embarassing. Me too. It came on over night practically and is all over my chin and neck. Its also slowly creeping up my cheeks towards my forehead. Help! I feel so much better on the shots but im depressed n embarrassed of how I look now......what to do!?!?!? This is my first time in my life i have Acne on my face,,, i feel bad because Dr. when he gave me 10 B12 shots did not tell me this will effect my face in anyway,,,i have 5 months left them and i have bad acne no stops from appearing,,,,when will they stop ? I'm on B12 shots 2ce a week and have horrible acne on my face, neck, back and chest. I can't stop taking my shots BUT I feel like I'm going into a deep depression because I look like a teenager in puberty. My dermatologist hasn't even been able to help me. I feel that I have to cover up every inch of skin because being able to see it is gross to me and it's just making me extremely self conscious. Does anyone know of any "cure" for this? I was told I had a B12 deficiency and am now taking shots of B12. I take 10,000 mcgs every two weeks. I recently just had my third shot. I rarely have pimples and before taking the shots my face was clear. Now I have pimples all around my mouth and chin and small ones all over my forehead. It is very embarrassing and stressful. Omg same here. I was told a while ago I had a deficiency so I have been taking supplements since August (almost 4 months ago) ca. every other day. Dosage was 5,000 mcg but it was an oral pill. However, I developed severe acne over my cheeks and neck and basically everywhere. I never looked like this - it is horrible! I never would have linked it to the vitamins but then my mom told me she heard this. I can't believe this. I stopped a few days ago and I hope it will go away soon, but from what I read here it can take a while. I hope it'll be faster! I dont even want to go out anymore. I started taking a hair vitamin that had a very high dosage of all types of Vitamin B. This included a high dose of B12 and B6, I began to see that a month in after taking this vitamin my skin was going crazy with acne flare ups. I had bad skin in my teenage years and even went on accutane to treat it, once the B12 and B6 was in my system my skin looked as if it did when I was a teenager. I had been going to my dermatologist not knowing what was the cause of my horrible skin returning and he put me back on all types of acne medication but the flare ups would still come. I am only just realizing now that these flare ups can be a cause of all this extra vitamin B I'm in taking and i was taking this vitamin for months. I'm very surprised my dermatologist didn't see that the high levels of vitamin B I had in my system could of been a cause this whole time. Needless to say I would love to know how long it takes for this to leave the system, I want my skin back. In my experience, no doctor or dermatologist has been remotely helpful at finding the source of my acne. You absolutely HAVE to do the research yourself. I've talked to 3 different primary care physicians and 1 dermatologist, and they all just suggested topical creams or bc or antibiotics or accutane. NO ONE asked a single question about my lifestlye to find the root of the problem. I'm not surprised at all that your dermatologist didn't notice the high levels of vitamin B in your system. I'm posting this as a Public Service Announcement for everyone who reads it: YOU MUST READ EVERYTHING YOU CAN ABOUT ACNE AND YOUR BODY. YOU MUST FIND THE ROOT CAUSE. YOUR DOCTOR IS NOT GOING TO DO IT FOR YOU. BE YOUR OWN ADVOCATE. IT IS ESSENTIAL!!!!!!!!!! I just want to share my little story with supplementing b12. I turned vegan around january 2014 and I didn't care for the first year about supplementing much. I took a few b12 pills (cyanocobalamin) sporadically with no noticable effects though it wasn't much so I didn't feel like I was supplementing it properly. 1 year into veganism I became a bit concerned about a B12 deficiency and I went to buy b12 iv/im injections (Erycytol). The doctor gave it to me (intramuscular) and the day after my first injection I got numerous relatively small pimples on the upper back/chest and facial area. (Should have done a blood test in advance). I had clear skin before that, so I'm pretty save to say that the Erycytol injection was the cause (probably overdose). Too bad I went for a second injection 2 weeks later (originally 3 injections should be done) Again I got more pimples show up. While they are not too nasty, they are itching a bit and are not exactly good looking as you can imagine. It's been around 5 weeks since the last injection and I feel like they are slowly starting to fade away.. I guess 1 or 2 more months and I have clear skin again. However, I'll do a full blood test this week to finally see my b12 level and other important vitamin/mineral levels. My son has had bad acne for awhile now. He is 16 years old and has had some other issues as well, like stomach problems. Recently, I had read that a vit B12 deficiency can cause stomach issues, like what he was experiencing. So I got some sublingual vitamin B and he has been taking it daily. His stomach is way better, almost back to normal now, but now he has TERRIBLE acne and it is just getting worse every day. I am stumped as to what to do. you can try to combat it by taking zinc supplements (make sure you take it on a full stomach or you'll be sick all day and you may wanna talk to your doctor) zinc pills are the most effective things I've used. you can also use the green mask by queen jelepe (I think that's how it's spelled) works better than any other topical I've used and it's about 3-5 bucks depending on where you get it (dollar general, walgreens, target, walmart). I also used eucerin for red marks but that's about 7-9 bucks and this works very well. use it in small amounts though because it's effect wears off after some time. the last two methods should still be effective even if you don't take the zinc though. How do i improve my skin breakout caused by my B12 injections if i am now on them for life ? Hi - just wondering if anyone has had this acne flare up, calm down, flare up and then calm down again? This is what my time line has been like: • Last week of January 2016 - 3 b12 injections (10,000 mcg) • Last b12 injection - Jan 28th • Major acne breakout - Feb 1st (red, blotchy, acne all over forehead, cheeks, jawline, spreading to neck) • Feb 13th - acne has calmed down • Last two weeks of Feb, acne has calmed down • First 1.5 weeks of March, acne flares up • Last 2.5 weeks of March, acne calms down Today, acne has flared up again. Acne on forehead and chin...ugh! I have stopped eating red meat, seafood, cut way back on dairy, I haven't been taking any b12 supplements whatsoever...but it's been 2 months now!!!! I'm at my wits end, I don't know what else to do!! Also prior to the b12 injections, I had been on acne medication for a year and had very clear skin. Now my skin doesn't even react to the medication other than sting for a bit. I will be going to see my doctor next week, because it's driving me insane. me too! Its been two months since my last injections but the acne is still there... it got better for a week and it came back even though I wasn't taking any more supplements. Its all over my forehead and cheeks... what did your doctor say? any suggestions? I had low B12 and was given injections for 3 weeks, with the 4th planned for next week, then one a month for 6 months, then one a quarter possibly for life! I have slowly been getting spots on my forehead and thought it was just hormones as I was due on. However, they didn't go and yesterday I had several more, followed by what is obviously an acne breakout today. I recognised it as acne as soon as I saw it this morning, as I had acne from 13-17. I am now 50 and have had clear skin since my teens, with the occasional pimple or two when due on. This is unbearable though; it is swollen and sore, the lumps are very red and all over my forehead, down the sides of my face, on my chin and in my hairline and eyebrows! I am not intending to have any more shots but how do I get rid of this!!!! Hi all, this happened to me too about 3 years ago. I was taking Biotin for hair growth. The B12 reacted with my skin and it took me months to figure it out. It took 3-4 months for my face to return back to "normal" but I still had some scarring on my cheeks. That is now thankfully gone now. Tip: at night, use a vaseline for face cream. Not a ton, just rub it in hands and pat on face. I use Lucas Paw Paw (you can get on amazon). For me, this helped with scarring and healing. Hope this helps someone! Honey and Turmeric powder is good solution. If someone has oily skin then vico turmeric cream is good option. I hope this post will be helpful. Well, i am in the SAME boat! Here's the bad news everyone, and it's bad news for all of you wanting a quick solution to your acne. The liver stores B vitamins for over a year. Google it ... My last B12 injection was in October I believe the first week of October. It's now February and I am still dealing with forehead chin cheek and even sometimes in my hairline acne. Two things that I found to help after reading many acne blogs we're two products you can get on Amazon and they're pretty inexpensive: Ole Henrikson African red tea foaming cleanser and Thayer's witch-hazel aloe vera formula toner. Wash your face with the cleanser. Douse a cotton ball with the toner and wipe it all over your face chest and back where you are breaking out. Do this twice a day. Be very careful what type of moisturizers you are using. I ended up using a cheap one by Oil of Olay because everything else made my acne worse. Mine has gotten better using these two products but perhaps it's just time as I'm almost 6 months out now from my B vitamin shots. What a nightmare! I feel your pain there are times I just don't want to leave the house or would not leave the house if I could avoid it. I am a mature professional adult woman who thought acne was 30 years in my past. I agree with some other posters your doctors and your dermatologist will not uncover the cause. Thank God for blogs like this.